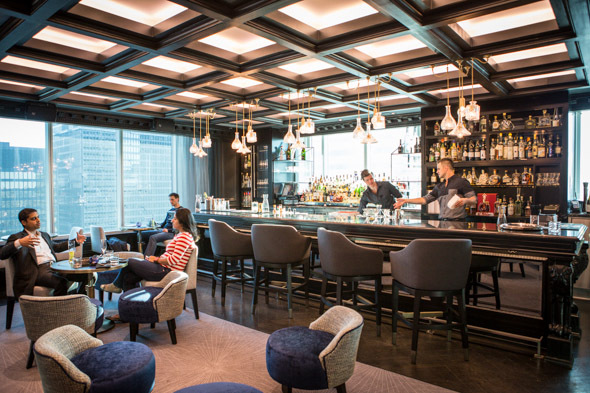 America, the newest incarnation of the Trump's 31st floor hotel restaurant, is a collaboration between Toronto's nightlife king Charles Khabouth , and culinary tycoons Oliver & Bonacini . Transformed in just a week's time, the overhaul sheds the austere persona of the fomer Stock restaurant and introduces an all new menu and softer, more whimsical atmosphere. The 110-seat operation consists of a lounge, mezzanine, dining room and terrace where guests can drink and dine from an aerial vantage point. Inside, artwork from Chad Wys and George Pimentel dominate the walls, illuminated by over-sized softbox lights. Khabouth's vision includes a supper club in the vein of past projects like Ivory or Ultra, though it's tasked with accommodating the needs of hotel guests. It's a tall order that strives for flagrant decadence - but also practical three-meal-a-day service. The menu from O&B offers nouvelle interpretations of iconic American standards, but not in the way you'd expect from a hotel restaurant. Rather than replicating familiar comforts of home, the food here is playful verging on eccentric. 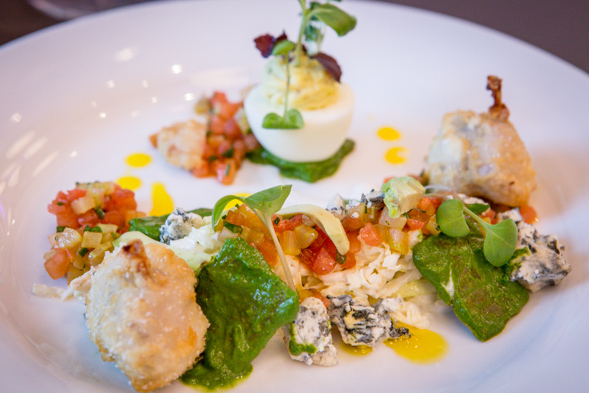 The cobb salad ($18) reworks the classic into a composed plate of crispy fried frog leg morsels and a deviled egg paired with nopales, avocado, sauce piquante, crumbled blue cheese and a shredded mass of ranch-dressed napa cabbage and iceberg lettuce. Laconic menu descriptions lead to surprises like the crystal fried western oysters ($23), which turns out to be an alien-looking dish. 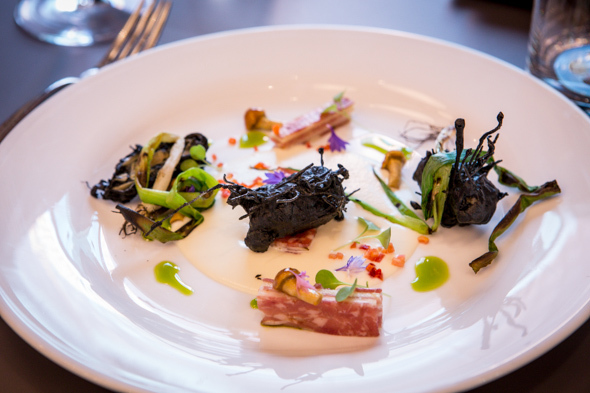 Coloured black with squid ink, crispy fried vermicelli entomb plump bivalves in a crackling shell. Set over a base of sweet kohlrabi and apple purĂŠe and paired with nameko mushrooms, saucisson and a confetti of pickled carrots, it's an engaging plate with tasty components and interesting textures, even though I don't find its haute appearance especially appealing. The slow-cooked Chinook salmon ($24) is less novel and infinitely more refined. The deep pink fish is cooked at such low heat it retains its raw colour, but its texture is luscious and gently flakes apart. 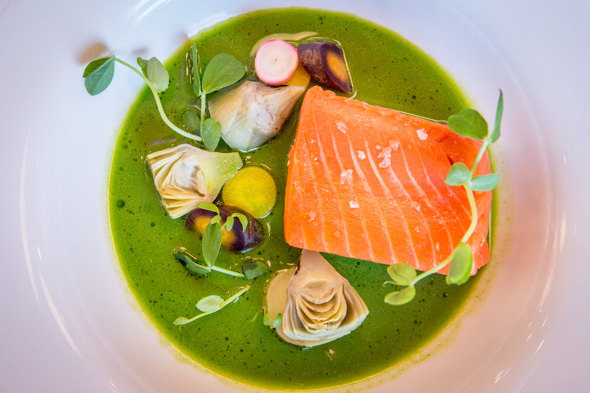 Wading in a pool of parsley vegetable broth studded with baby artichokes and fingerling potatoes, the pretty colours are really memorable. The multipage bar menu is extensive but well-organized, with a table of contents to ease the selection process. Sommelier Scott Zebarth builds on the existing wine list, rounding out the base with an eclectic list of new-world labels from top producers in the Americas (Argentina, California, local). 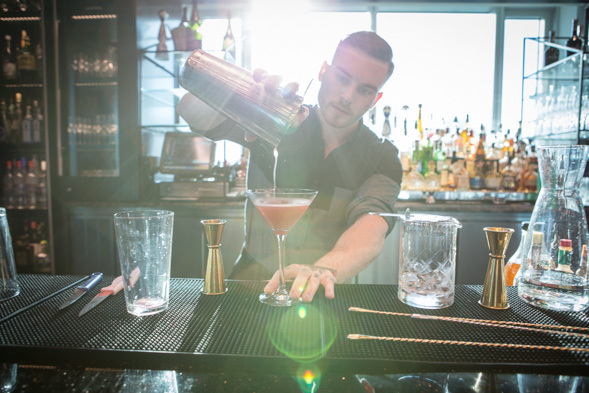 By the glass, 5oz pours start at $14, though the sky's the limit if you want to get fancy. 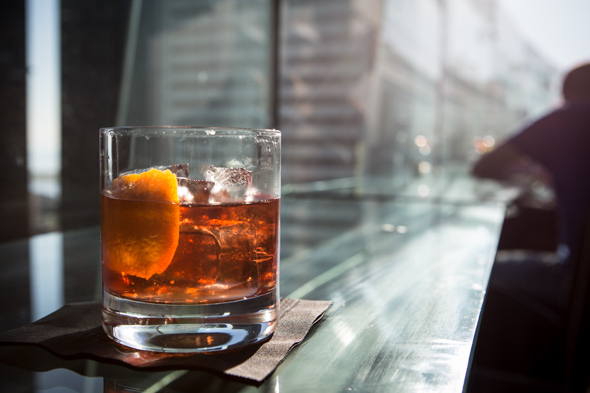 Cocktails, like a barrel-aged negroni, are generally priced at $18. Week-round, America is open from 6:30am for weary travellers willing to shell out $25 on continental breakfasts. (This must feed a small family, right? It even out-prices the benny at $21.) Nightly, the kitchen is open 'til at least 10:30pm and from Thursday to Friday post-dinner, the venue pumps loud DJ'd music throughout and fuels a clubby vibe with bottle service.